If you ask any artist what the most difficult thing about their business is, I would bet, shooting great images of their work is at or near the top of that list. It's definitely at the top of mine. As I don't possess the budget to hire a professional photographer and editor, I instead, invested countless hours researching, experimenting, shooting, re-shooting and purchasing a few tools to aid in the photographic process. Some may say, with all the hours you spent on this, perhaps hiring a professional may not have been so costly. My response, you are likely correct. Still, I wanted to learn this skill, become proficient enough to create great images, and add it to my list of accomplishments. Is the ongoing learning curve worth the overwhelming time and effort? For me, yes. For others, perhaps not. I scoured countless articles and blogs regarding product photography, and most suggest a white or neutral background for most everything. Websites, submitting images to potential clients and any social media or catalog placements. With this in mind, I gave it a go. My set up is simple with all the basic equipment for product photography. I also followed the suggestions for lighting, camera settings and opting for a white background. I must admit, after re-shooting and editing my entire collection I thought, what did I do? I had been so used to shooting on a gradient, or gray background, so seeing my images float on stark white was quite startling. It took a while before I liked what I was seeing. This change made my website look much cleaner and minimal, which better reflects my design aesthetic, so double bonus! If you visited jackiejordanstudio.com in the past days, the changes in my images are evident and I would love to know what you think! I've learned a tremendous amount in this quest for, if not perfection, at least images I am proud to publish. There is still much to accomplish and learn, but I am thrilled I made it to this place in my photographic journey. My next quest, modeling my jewelry to showcase size, proportion and aesthetic. A scary proposition, but one I must take on. Wish me luck in pursuing this next milestone! For those of you who take part in art shows and sales, you can relate to how much time and effort goes into each one. No matter how many times you have prepared for an event it appears to get no easier. Sure, maybe all of your items have a price tag on them, and are show ready, or are they? I must check and double check each item. I must clean and polish everything to look its best. I must account for and package each item for every show. 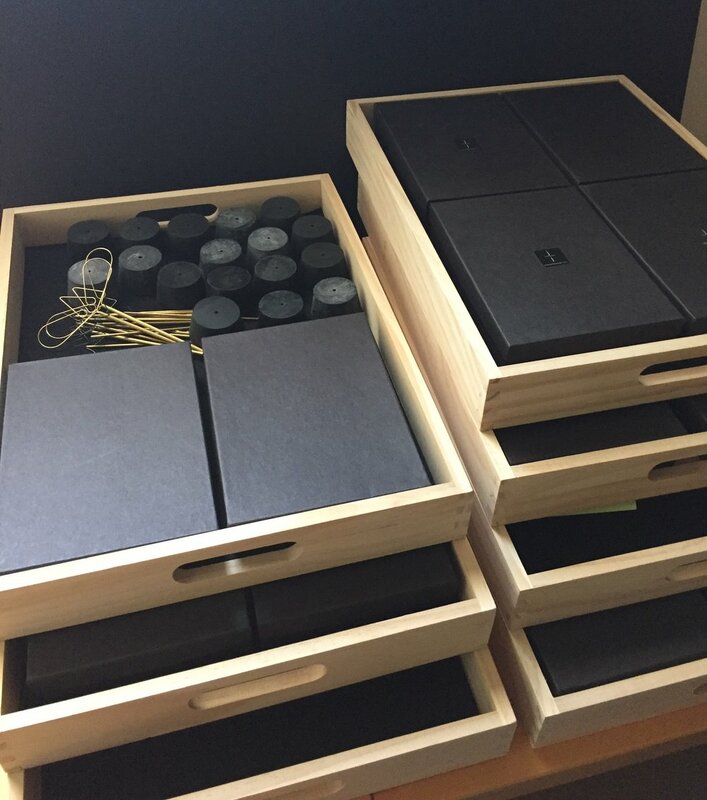 Each display must be in its best shape, ready to make my jewelry shine. It is a ritual and a process and the only way to have a successful show. With practice I have a better system in place than when I began this adventure. I assign each collection of jewelry to a display that will showcase the item in my booth. I carefully stack and box each display in the order they will appear in my booth, and I can now get all of my jewelry and displays on to a single flat bed cart! An achievement I am very proud of! My greatest accomplishment is the fact I can break down a show in less than 30 minutes! That alone is a feat worthy of noting. I will go through this ritual once again as my next show approaches. Join me at the Dallas Contemporary Jewelry Show Pop-up on June 15 and 16 at Art on Henderson, 1802 McMillan Ave. Dallas, TX. I know, just one more thing to sign up for. Well, I promise I will only email you once or twice a month and only when I have something new to share or a special offer you may be interested in. So, give it a try, click here and head to my home page where you can sign up for the latest, you wont be disappointed!